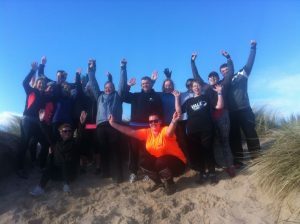 Northern Bootcamp is a leading provider of boot camps for women and men of all ages and abilities. Our boot camps come in all shapes and sizes, just like you! You cannot be too unfit or too fit to attend our camps, as every session is tailored to you. You will work at your own level and with different fitness and weight loss options available, you can be sure to find a boot camp that suits your weight loss and fitness goals. We run fitness and weight loss camps for your chosen number of days, which is the real variation in the camps. From a weekend kickstart bootcamp to a 14-day, life-changing bootcamp experience. We have 3 locations: Bamburgh Northumberland, Lagos Portugal or your own personal choice: we can bring our expertise to your home, your country, or your preferred venue as a bespoke bootcamp. All of our bootcamps are carefully designed by Dan and Caroline, the company directors, who are still heavily involved in the training sessions and programmes. With an incredible team of experts and support staff who have specialist areas of skill and knowledge, you can rest assured that you are in the best possible place to meet your fitness and weight-loss goals. We know many of you like to know what the program will be like or what to expect on your camp. We don’t reveal the program, mainly as many do get anxious about what is to come but also weather and fatigue of the group does alter the program. Here at Northern Bootcamp every day is different. If you’ve decided to change your life with our boot camp or simply want to detox we understand that the unknown can be scary! Our non-military and non-starvation boot camps are consistent in providing results and a homely culture. ALL boot camps are inclusive of ALL fitness and ability levels and include healthy locally sourced meals. Here is a one-day diary from one of our 7-day camps to give you an outline of what to expect and what you can achieve! Up and showered for our usual 7am meet. 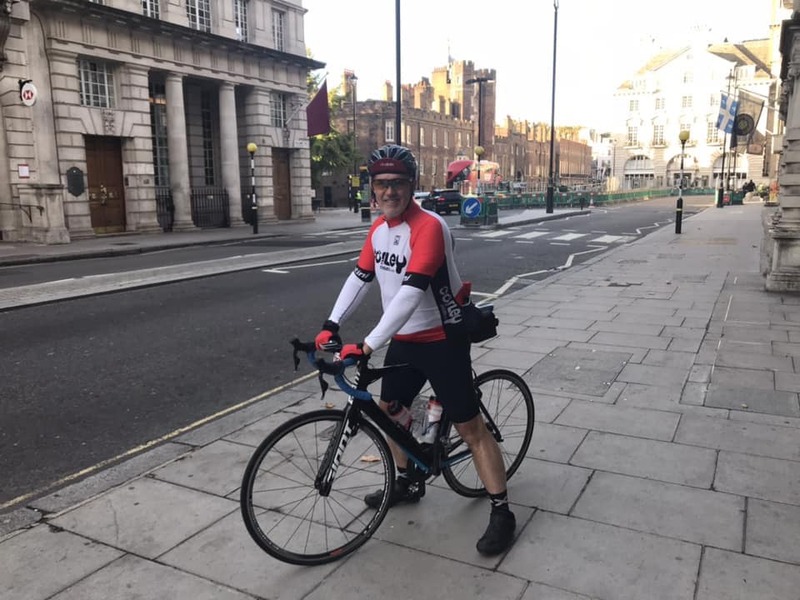 The aches and pains starting to become part of the morning comedy routine of getting out of bed although they are easing as the week progresses – excited to see what lies ahead today. It felt good to get my joints moving this morning ready for our first session of the day. We are told that the session is called Fartlek! 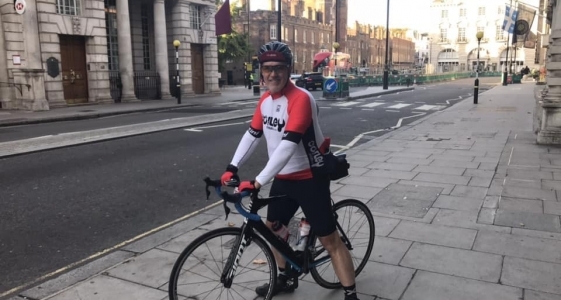 I had never heard of it but really enjoyed the fast-paced HIIT session as it really helped to get the mind and body going. I am not usually a morning person, but I am beginning to enjoy these sessions as they have very quickly become part of my routine. Looking forward to my well-earned breakfast now! This morning – toasted granola and yoghurt – I am really appreciating all the food and tastes. TRX session this morning – a stationary setting! I was mistaken when I thought this meant easier!! I surprised myself with what I was able to achieve and this will be totally easy to recreate at home! I know I will feel this one in the morning! It was also great to partner up. To think that when I booked on by myself and I thought I would be lonely, I couldn’t have been more wrong! The team and group are an amazing support, we have kept each other going, think I have made some lifelong friends. Morning snack time, delicious! It’s great how the day and sessions are broken up around snacks and meals. The title on the board for the next session is ‘Partner Chipper’! Somehow, I don’t think this has anything to do with potatoes! Just finished the session! Amazing! Partner Chipper was a session with your partner aiming to achieve a shared target. My partner was a bit fitter than me but we both were able to work to our top ability and get the most out of it, egging each other on and a healthy competitive spirit with the rest of the group. Time for lunch and a bit of a break now! Longer breaks don’t happen too often but it’s nice to escape the group for a little while, check on home and emails. Many on my camp are here to get off the grid altogether so it must be nice for them to chill. Not many times in life you get to escape like this and concentrate on just yourself – I am taking full advantage. As always lunch is locally sourced and homemade. I read reviews before stating how there was plenty to eat and not to think of this as a ‘starvation’ camp. They were exactly right, I love my food and have not once felt hungry. We’ve been given a choice this afternoon, body boarding in the sea or a mountain bike session. I use my bike a lot at home, so I am choosing something out of my comfort zone. 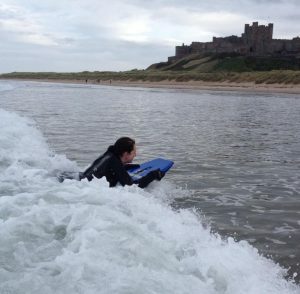 Four days ago, if you’d have asked me if I would be body boarding in The North Sea, I would have thought you were mad. Wetsuit is on and wish me luck!!!!!! Oh, my goodness, what an experience, the beach was like something out of a movie with backdrops of Bamburgh Castle. I have never felt so exhilarated in my life! I have already googled to see if this is something I could do again when I return home! I’ve also been told I can do the mountain bike activity tomorrow too! Snack time now. I never thought grapes and almonds would ever taste like the biggest treat!!! Feeling great and smug because of my afternoon achievements! Can’t wait to tell the kids and show them the pictures! Back on camp now for our last session of the day before dinner. Glute activation. The knowledge these guys have is immense, it not all about high intensity sessions, they really do know their stuff and constantly research new ideas. My favourite time of the day. I feel a great sense of achievement today, over half way through camp and can already feel big changes physically but also mentally. I have my 1-2-1 tomorrow with Caroline. She will plan a program to install these new changes into my working week at home. I know sometimes life gets in the way, but I am making promises to myself this week that I know I want to keep. Dinner was a beautiful, a two-course meal as always, home cooked and hearty with a stunning chocolate dessert. That is certainly something I didn’t expect to say on a weight loss and fitness camp!!! This evening I have a massage booked then an early night with my book. Really enjoying some time to my own thoughts and getting my head down early for a change. I have never slept as well as I have this week and that’s even sharing a room. The rooms are so comfy it’s hard not to sleep as soon as your head hits the pillow. I may have had some worries prior to coming, day three made me question my reason for being here. However, now I feel I have come on leaps and bounds and the end is in sight. I am looking forward to our last day and finding out my results before heading home. This was only one day during my camp, there are many various sessions and activities that you will take part in. I understand now why the team don’t outline the week plan as you can get anxious about what is ahead, and things do change. Just take it in your stride and push your limits and comfort zone and your will achieve more than you ever imagined. If you like what you’ve heard or are simply just ready to start a journey, why not book a boot camp with us? If we haven’t answered all of your questions, check out our FAQ or feel free to get in touch. You can then check out the bootcamp dates and book your bootcamp online! The longer camps are packed with even more features – check out the individual pages for each camp for more information. 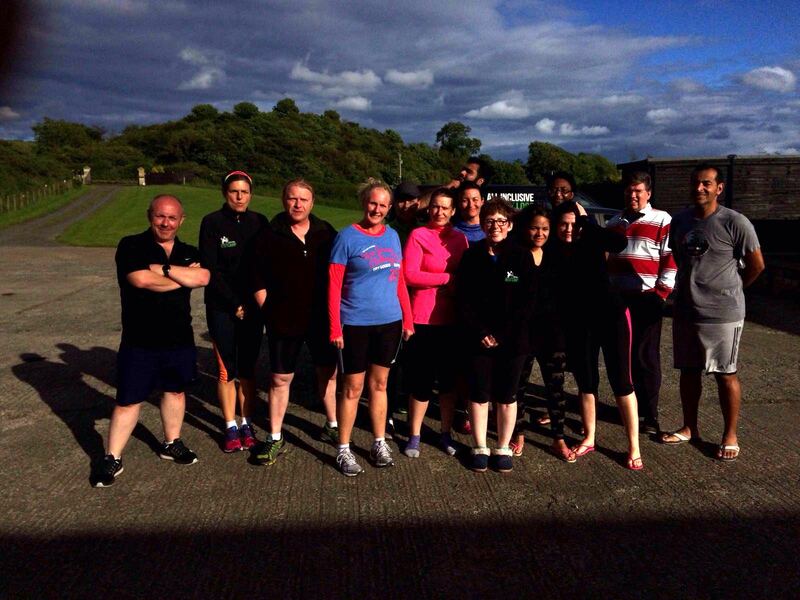 We can also design a bespoke boot camp just for you and your friends. So whether you want a hen party with a difference, you are a sports team and want a training camp, or want to get in shape with your work colleagues, then please contact us! If in doubt read our success stories or watch some video testimonials here. The ratio of instructors to clients is small and we will not compromise on the quality of instruction and individual client attention. We are a very personal camp that genuinely care about you as an individual and therefore our trainers take time out after session to address any issues, adaptations needed and to make sure we know you as an individual. While it is not one to one personal training, you will have lots of individual advice, instructor contact time and personal attention to make sure you get the maximum benefits from your time with us. One-on-one time means that you can be pushed to stretch your boundaries, while working within your physical limits. You will also have contact time with head trainers Dan, Caroline and Dave, who share their training tips and nutritional advice freely. Many feel inspired by their passion and dedication to your health and fitness. 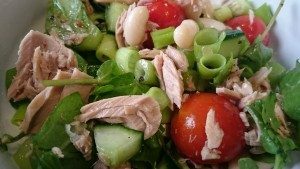 On the UK boot camp holidays and weight-loss holidays, you will have a full one-to-one consultation to develop an action plan to take home with you. While Dan, a co-founder of Northern Bootcamp, has 13 years of military experience as a physical training instructor, the style we roll with is most certainly non-military. The training culture is firm but fair, designed for you to get the most out of the sessions. We will not punish you, single you out in group situations or destroy any morale. However, this does not mean that Northern Bootcamp is an ‘easy’ camp. It is tailored and adapted so that you will be massively encouraged to work at a pace that is suitable for you. If you need pushing harder, we will do this by increasing the intensity and providing the necessary support. When we recognise that something isn’t working for you, we will change the exercise to ensure you can still take part and remain active. The culture of Northern Bootcamp is relaxed. The programme is full and the intensity of the sessions is often high, but we want you to relax post-session and enjoy the whole experience. We do keep you busy, so there is not a great deal of time to chill out during the day, but we have optional sessions in the evening so you can take time out. Our trainers are very open, approachable and dedicated to your success on camp. They have years of experience in fitness training and group management, so are adept in identifying points where changes can be made. This means that your wellbeing is professionally managed at all times. Any images of boot camp dormitories and plastic mattresses can be banished immediately: our new boot camp venue is 5-star! We have a fantastic chill-out room, a comfortable stretching room, a campers’ kitchen and dining area, high-quality beds, and luxurious bathrooms – you can see why the phrase boot camp may seem out of place. 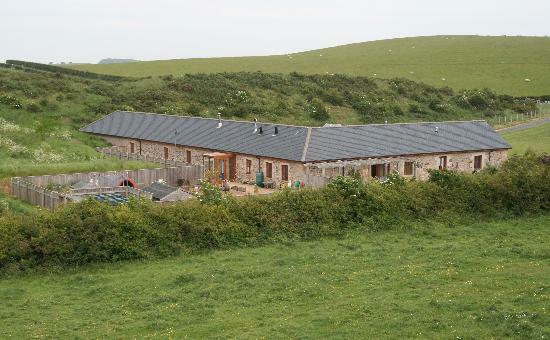 The sleeping arrangements are flexible, so that you can choose the best option to suit your budget and your needs. 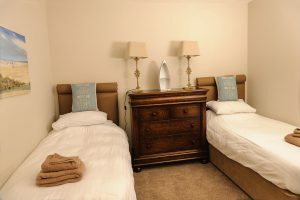 You will have the option of a shared 4-bed room, a twin room, a double or a private en suite – all at great value prices. The camp menu is designed and delivered with such love and passion it is not surprising that 98% of campers rate the quality of the food as excellent. All main ingredients are locally sourced from the butchers, grocers and fish mongers and as fresh as they can be, often home-grown and more importantly, cooked perfectly. You will eat 3 meals and 2 snacks per day. The portion size is controlled and the menu is set and aligned to the exercise sessions that you will take part in each day. You can rest assured that you will not be starved and that you will get enough energy to ensure you can participate fully in each session. We also believe that your experience on camp should be enjoyable and that includes the meals that you eat. Check out the bootcamp kitchen page for more info. 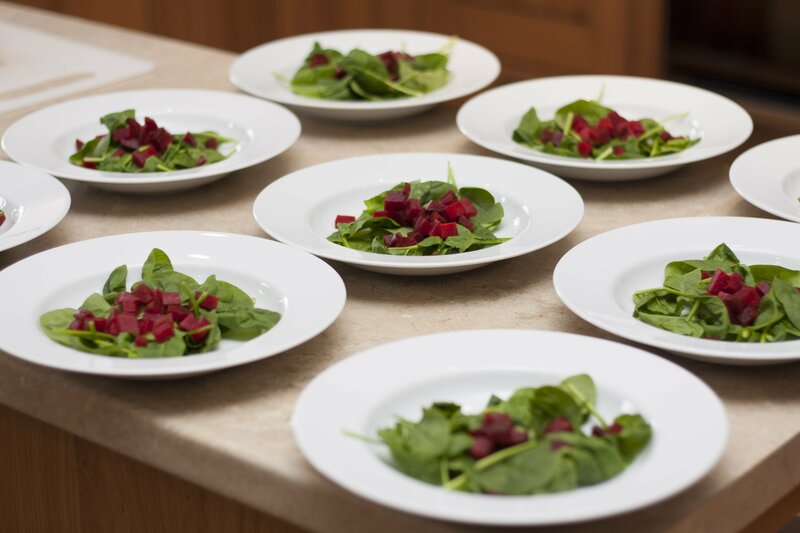 We make sure the portion sizes are sufficient to be sustainable back in the real world and you can take away ideas and recipes to help you start cooking. If you have any dietary requirements, or even distinct dislikes, we can usually cater for them. Every day on boot camp is an adventure; we make sure that the schedule is full, varied and interesting. Variety is the spice of life, but it is also the key to successful fitness and weight loss. At boot camp, the training team are clued up on all of the latest fitness evidence so that they deliver the most effective sessions for you as an individual. The trainers are experts in their field, in cardio sessions, interval training, kettlebell classes, strength sessions, boxing tuition, primal movements, Pilates, circuit training, core stability workouts, glute activation, foam rolling, lifting techniques and more. 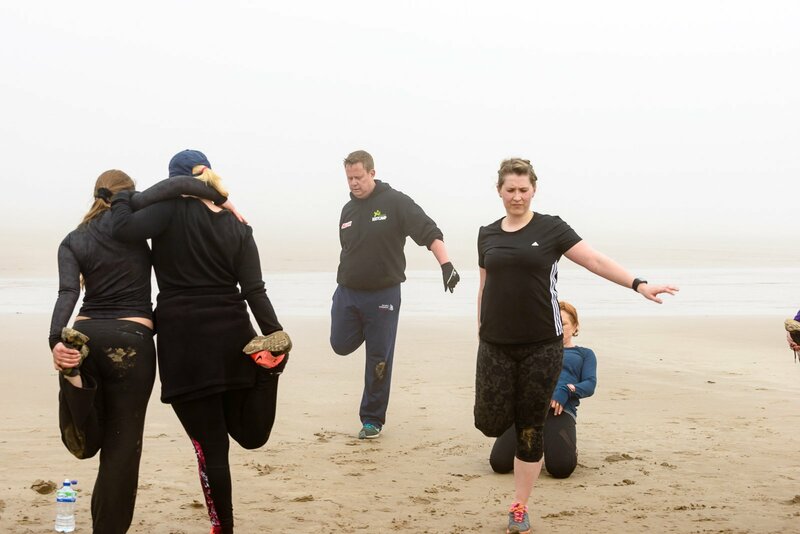 As well as the effective fitness sessions, at Northern Bootcamp we incorporate unique and more adventurous activites into the programme. 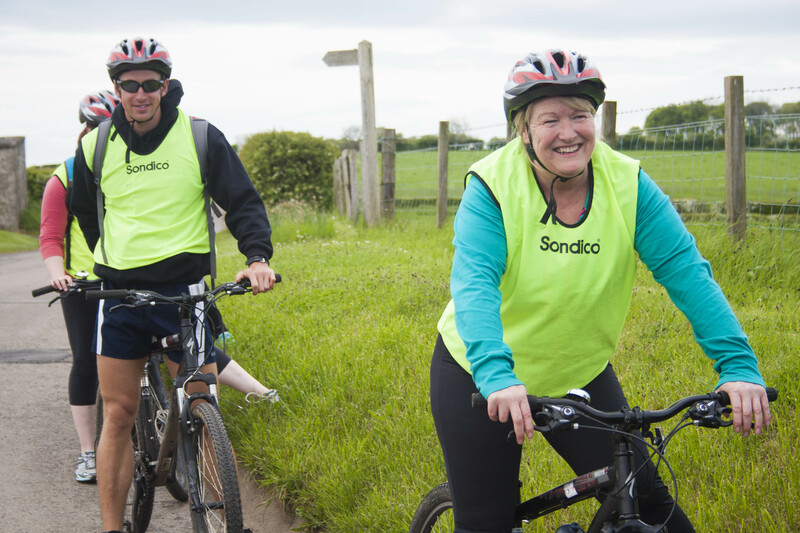 These outdoor activities all operate under our ‘challenge by choice’ policy, so you will not be forced to take part. 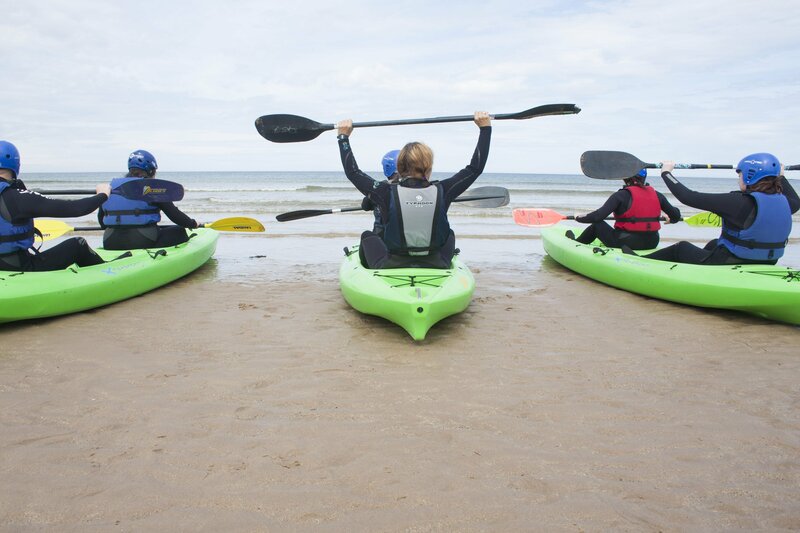 However, if you do choose to participate, you could find yourself canoeing down a river, abseiling over a cliff, mountain biking in a forest, surfing a wave in the sea, coasteering and jumping off a cliff into the sea, firing arrows, learning to read a map while running, or hiking up the Cheviot Hills. 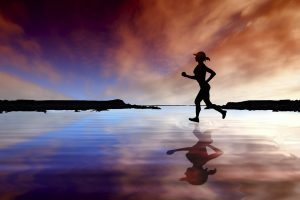 You will have some fantastic opportunities to focus not only on fitness but self-discovery and enjoyment too. The programme for each camp is not disclosed and the reason is not to keep you in the dark, it is simply because it changes regularly. We have more flexibility than most, because of the diversity in the instructor’s skill set and we can therefore adapt the programme to suit the weather, the group and any other factors that come into play. With more and more boot camps popping up, how do you know which one offers the best value for money? 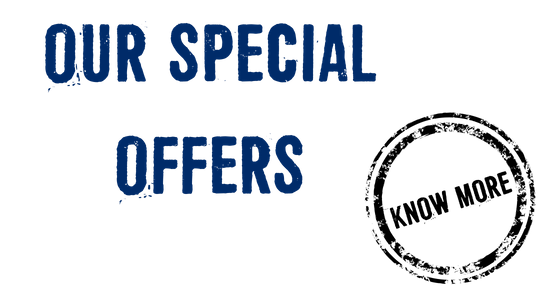 At Northern Bootcamp, we offer extremely competitive boot camp prices. Certainly not the cheapest but in terms of quality, you will not get a better experience anywhere. We are 100% confident in our product and the fact over 60% of our clients return to us within a year (sometimes 5 times a year) proves that we are doing things right. The Northern Bootcamp team are dedicated to delivering the highest standards of training in every single session. The programme is more diverse than any other, meaning you will work all muscle groups in your body effectively and gain maximum benefit from your time with us. Minimising injury and importantly having fun. 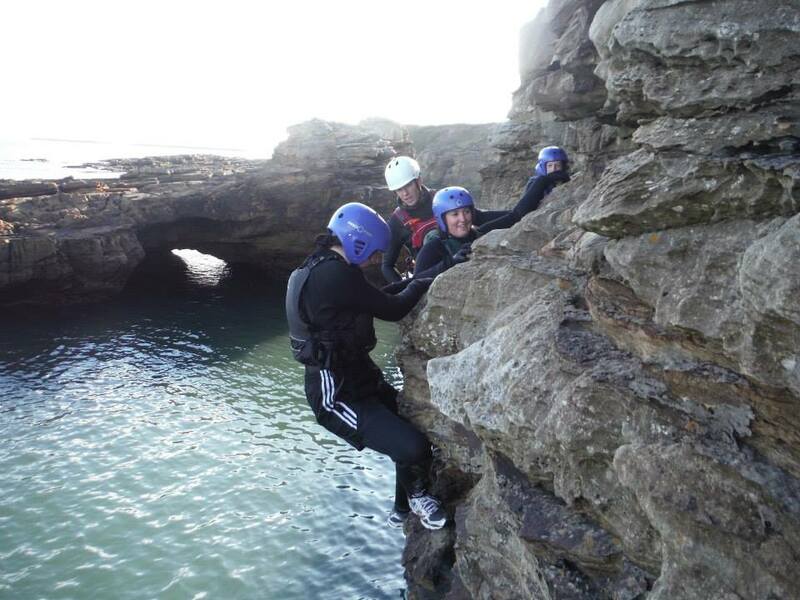 You will also have opportunities to try adventure activities that as a standalone activity can cost up to £70. The sessions are unique, designed around our client needs, with exercise often hidden so that you can work hard without even realising it. The fun-loving nature of the team ensures the atmosphere on camp is relaxed and happy and sessions are delivered in a positive manner. While it is hard work, we do want and expect you to enjoy your boot camp experience too. 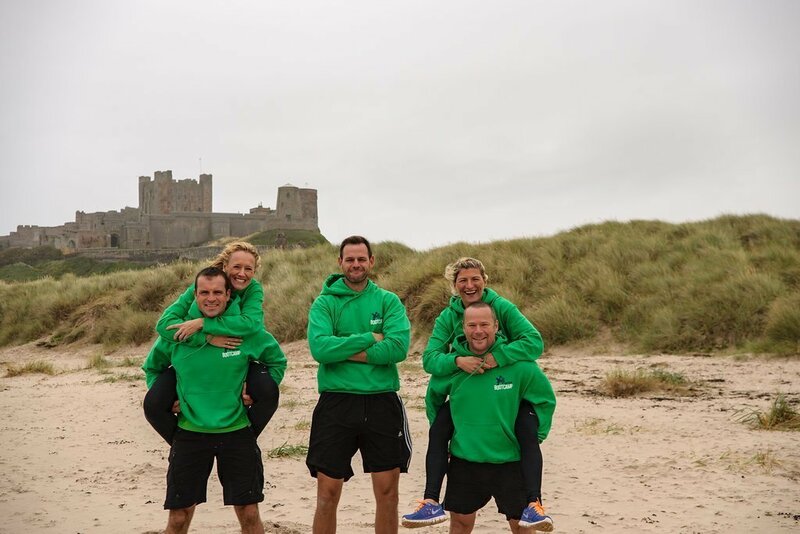 The accommodation is value in itself: the chance to visit such a stunning environment and work out on Bamburgh Beach is one of the highlights for many of our returning campers. We do not stay onsite all day; you will visit many of the area’s attractions, including Holy Island, the Cheviot Hills, miles of the untouched beaches and also ancient forests. If we haven’t answered all of your questions, check out our FAQ or feel free to get in touch. You can then check out the bootcamp dates and book a your bootcamp online!